Gary Anderson has had enough. He had requested court hearings for three speed camera tickets from Forest Heights which he had received in September of 2010, believing the cameras were inaccurate. Over 9 months later all he had received were letters imposing late fees and threatening to suspend his registration. 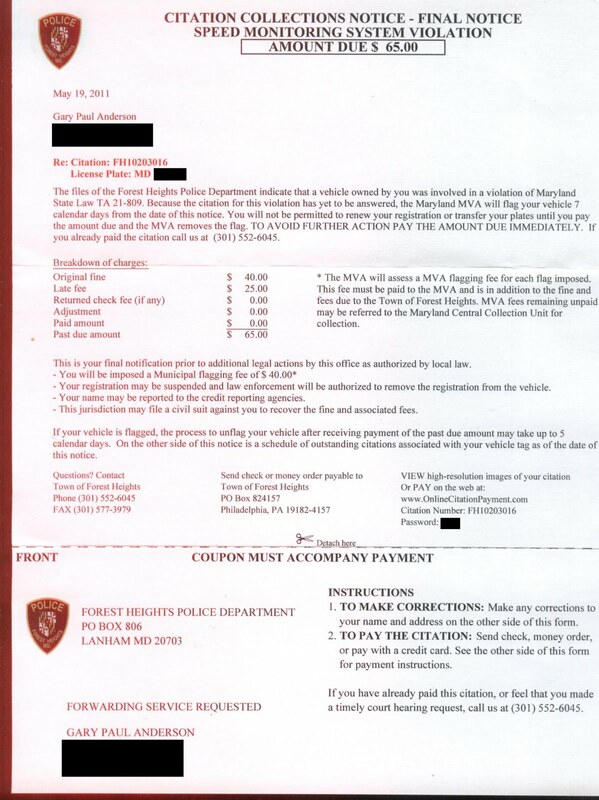 Having failed to work out the matter with the MVA, and still unable to get a hearing date from Forest Heights (and the town's speed camera contractor, Optotraffic (a division of Sigma Space Corporation), who is responsible for scheduling court hearings), Gary decided his only recourse was to file suit in federal court against the Maryland MVA and Forest Heights. 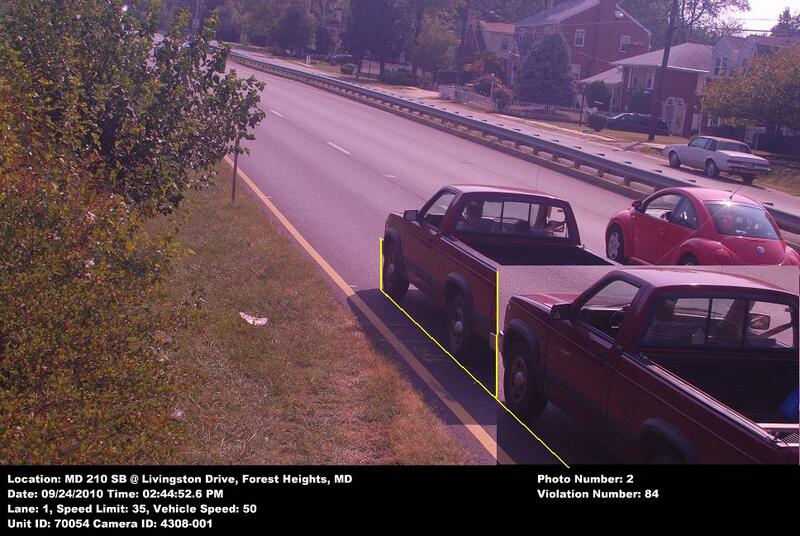 (Note : We've posted other photos of such apparent errors by Optotraffic cameras in Forest Heights and New Carrollton, and a disproportionate number of errors with this type of camera seem to have been with pickup trucks. We will be posting a technical explanation why that is the case in the near future). 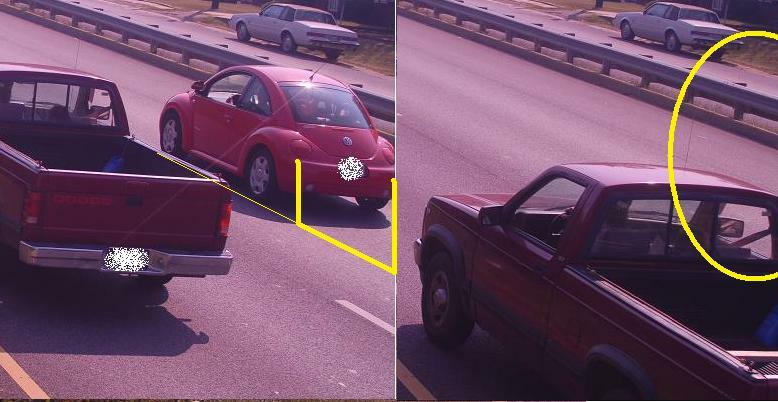 Here is a composite image of the two, using a technique successfully used by other drivers to challenge tickets from Optotraffic cameras. this would, based on the 0.3s shown on the citation and an estimated 17 foot distance, indicate a speed of 38.7mph. At a .3s interval, the vehicle would have needed to travel 22 feet (5 feet more than the actual distance traveled) to be going 50mph. Now granted, timestamps are shown rounded off to 0.1s. That is curious, because previously numerous tickets issued at this exact spot showed THREE decimal places of precision, and a time interval of precisely .363s (which corresponds to a vehicle traveling 25 feet at 12mph over the limit, which was Optotraffic's stated target distance between frames). If the .363 interval had been used (rounding off) the computed speed would have been 32mph based on the 17 foot distance traveled. Optotraffic made this change to the precision of its image timestamps shortly after people started using time stamped images to question speed readings. A similar change has been observed in citations from New Carrollton and Cheverly (where there were also accuracy questions raised around the same time),where older citations showed 3 decimal places precision and recent citations show only 1. Optotraffic has argued this method of verifying speeds using citation images is not valid (a convenient position for them to take). First, they tried to argue that brakes had being applied. However no brake lights are on in the photos above. Also, the distance between the sensor and the camera is in fact very short, in this case the vehicle had not even moved fully into frame so it had traveled substantially less than the designed 50 foot distance to the first image location, no more than about 33 feet. That is simply not much time to decelerate and still show no brake lights. There is a tickmark on the road, exactly 50 feet after the camera, which is near the front of the truck in the second image, however this mark is where the truck is *supposed to be* for the first image. We would not expect it to be a full truck length short of that tick mark if it had been going above the threshold speed at the camera..
Next, Optotraffic recently tried to argue (only recently after all their other arguments had been shot down) that the time interval is not correct because the photos may be delayed after the camera is triggered. That is flawed first because we are expected to believe a scientifically precise piece of equipment cannot record an accurate time stamp. But more to the point, the only way that effect could be the cause of an interval being *shortened* would be if the first image, but not the second, was delayed (if both were delayed the interval would be the same, and if only the second was delayed the time interval and thus the distance traveled would be longer). But look at the first image: the vehicle is not fully in frame! If Optotraffic's explanation were true that would mean they INTENDED to photograph the vehicle at least 5 feet sooner, when it was EVEN MORE out of frame. This conflicts with their own statements that the first photo is taken 50 feet after the camera, and doesn’ t make sense because citations would not be legal if a vehicle ended up being completely out of frame in the first image. which seems to be a good bit more than 3.5 feet. Yet in image #1 no portion of the VW is in frame. Had the truck been traveling 15mph over the limit as the citation states, we would have expected it to be traveling faster than the prevailing speed of traffic. But if anything the bug actually gained on the pickup between frames. And then there's the fact that Optotraffic did in fact lower the precision on its timestamps, which is an obvious attempt to obscure information from defendants and prevent them from doing what we just did here. Maybe Optotraffic should try rounding timestamps off to the nearest second just to be sure? But heck, let's say we are completely wrong, and Gary really was speeding. Under our justice system the accused is STILL entitled to a court hearing. And he STILL has a right to have that hearing take place before the state suspends his registration. But Forest Heights and Optotraffic have thus far not seen fit to provide a court hearing. All he received, for nine months, were notices like the one below, threatening to suspend his registration and imposing late fees. 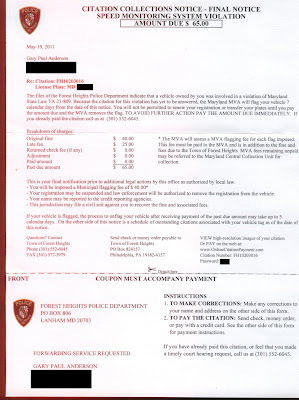 Notice that the return address on the form says Forest Heights Police, but the address says "Lanham:. These notices are being mailed by Lanham based Optotraffic (a division of Sigma Space Corporation), and it is Optotraffic who is responsible for scheduling court hearings for the city, a duty which is apparently too difficult for them. In fact, Mr Anderson is not the first to be in this situation. We earlier reported on similar denials of due process ant threats by Optotraffic and Forest Heights made to other drivers after they had requested court hearings. A few weeks ago Mr Anderson got a suspension notice on his registration from the Maryland MVA, but still no court date despite repeated attempts to get one. Enough is enough, so Mr Anderson is taking the matter to federal court and has sent a notice of intent to sue. He needs to pay $350 just to initiate the suit in order to defend his right to due process for his 3 citations (worth $195 total including $75 in late fees). He is facing a local government which has issued over $2.9million worth of tickets (which represents about 32 times as many citations as there are residents in Forest Heights), and which can spend all that money taken from out of town motorists to hire attorneys to fight this 'pro se' (self-represented) plaintiff. Gary Anderson has little legal experience, but as he stated to us in an email "As a Former Marine I believe in the RIGHTS of US Citizens, I don't like to be Bullied, Threatened, or Screwed." It is David and Goliath. But Gary is fighting back to protect YOUR right to not be mugged or blackmailed by corrupt local governments and by camera companies which get a percentage cut of every ticket. What have you done today?